Even if you love your tattoos, there are probably times you wish they were out of sight. You might, for instance, worry that the tattoo on the back of your hand will give the wrong impression during a job interview or if you have to appear in court. Or maybe you have an obnoxious uncle who will probably make a lot of annoying and awkward comments about it at the upcoming family reunion. You might even be auditioning for a part in a play or a film but feel that a tattoo would be the wrong image for the character. In addition, many professional makeup artists are hired to temporarily cover the tattoos of brides, who don’t want it to clash with their wedding dress, draw too much attention to it, or have it featured in their wedding photos. Yet is a makeup cover job, something you can do yourself at home and how effective is it? In this post, we’ll tell you how to cover a tattoo using conventional makeup and answer some common questions about concealing tattoos. Can Tattoos Be Covered Up by Makeup? Does Special Makeup Need to Be Used? Will Makeup Completely Cover a Tattoo? The simple answer is yes. You can use makeup to cover any tattoo. Even black tattoos can be concealed with the right products, though they’re more challenging to cover up. In fact, with the right technique and enough patience, there’s no limit to what tattoo you can cover. Even a full sleeve can be completely concealed and made to look like it has never been inked. You don’t need any special products to conceal a tattoo. Your basic, everyday makeup is designed to cover small blemishes or to accentuate and enhance your features. They were not created to handle the bigger job of concealing tattoos. Still, that doesn’t mean they can’t get the job done. Drugstore makeup can do the trick if it’s applied properly, used in the right combinations, and matches your skin tone. We’ll run through the process step-by-step in the next section, but for now, let’s look at two other options. Depending on what effect you’re trying to achieve, how long you want it to last, and how easy you want the application to be, you might consider using one of these specialized products. Corrective makeup products (sometimes referred to as camouflage makeup) are specifically designed for heavy duty cover jobs. They’re designed to cover the kinds of skin discoloration that are still visible even after applying a simple concealer. These include the scars and other skin alterations that results from surgery, various skin conditions and diseases, and other skin markings such as birth marks and sunspots. As you can imagine, a product designed to conceal these kinds of blemishes can also be effective at hiding at least some lighter tattoos. These products are easier to use – all you have to do is apply and blend (though you might decide to use additional products, like a setting powder to help the coverup last longer). It’s a lot more straightforward than the makeup hacks you have to use when covering up with drugstore products. However, the downside is the cost. As a specialized product, it generally falls in the higher price range, especially when compared to generic brands of everyday makeup products. Theatrical makeup (also known as stage makeup) is what professional makeup artists use on stage and film actors. Since this kind of makeup is used to create all sorts of effects and can dramatically transform the look of an actors (it’s how zombies get that dark, bluish purple skin shade and how middle-aged actors can be made to look like high schoolers), it can certainly be used to cover up tattoos. It’s also very resistant – it has to stay on while actors are sweating it out under hot stage lighting and not smudge when a scene involves a lot of contact. The downside to this type of makeup is that it’s really heavy stuff, so it doesn’t allow your skin to breathe freely. If you’re looking to cover your tattoo regularly (say, every time you go into work or a job interview, or on your weekly visits to grandma’s house), you should consider other options. Alright, so now you know that you can cover up your tattoo, how can you do it without hiring a professional makeup artist? Here are the steps you need to follow to conceal your tattoo. Step One: If any body hair has grown in the tattooed area, start by shaving it off. The hair could interfere with the results you’re trying to get, and the makeup-covered hair might be a dead giveaway that you’ve applied makeup to that spot. Step Two: Apply concealer to the area you want to cover. Make sure it’s lighter than your natural skin tone (this is just the base layer of your coverup and it’s meant to even out the different tones in your tattoo, not match your skin). Step Three: Next, you need to neutralize the darkness of the tattoo. You’ll do that using, of all things, orange or pink matte eyeshadow or lipstick (whichever color you think works best with your skin). To get the right results, make sure you dab it on instead of rubbing it. Step Four: Apply a light layer of hairspray to the covered area. That sets everything in place and will keep it from smudging off on your clothes. For the best results, especially if you have a darker tattoo, repeat steps three and four. Step Five: Now that you’ve neutralized the features of the tattoo that are difficult to cover, it’s time to make it look natural. Apply a concealer that matches your skin tone and blend it in. Apply another light layer of hairspray to set everything in place. Step Six: Finish it off by gently dabbing on foundation powder using a brush. Again, this is the DIY approach, using regular everyday makeup. There are specialized alternatives you can use. If you don’t want to use hairspray, for instance, you can spend a little more to get specialized setting or sealing spray. As mentioned above, you can also skip a few of these steps (like the eyeshadow/lipstick layer) if you’re using a product designed specifically to conceal tattoos. You can completely cover a tattoo using makeup. Although, some tattoos are a lot more work and, depending on why you want it covered, may not be worth all the time and effort to cover up. Here are the main factors that will affect how easy and effective your makeup cover job will be. Obviously, the size of the tattoo makes a big difference. Not just because there’s a lot of work covering it up, but because any imperfection in the coverup will be noticeable. When you’re covering up a small heart tattoo on your chest, if the tone looks slightly off, it will just pass as an ordinary blemish. After all, if you take a look at your body, you’ll see that your skin tone is varied and isn’t identical in every spot. On the other hand, if you’re trying to cover up a half-sleeve or a tattoo that covers most of the back of your hand, that’s another story. If a large patch of your skin looks, say, a little too pink, then it won’t just look like normal variations in your skin. It will look like you’re, well, trying to cover something up. The location of your tattoo will make a difference for a few reasons. First, there’s how easy it is to apply the makeup. If you’re covering up a tattoo on your shoulder blade, it’s best to ask a friend to do it for you instead of contorting yourself in front of the mirror. Also. there’s the noticeability factor. I don’t know about you, but I don’t usually look at people’s elbows. So, if you’re covering up a tattoo on your elbow, a quick job might be sufficient. On the contrary, if you’re trying to cover up a tattoo in an area that gets more attention, like your shoulder, hand, or neck, you’ll probably have to put in extra work to make sure it’s completely concealed. Finally, you have to consider how often the tattooed area will come into contact with things. Makeup that’s covering a tattoo on the back of the calf might rub off on a sofa you’re sitting on, for instance. Or if you’re covering a tattoo ring that winds around your finger, it’s likely to rub against anything you pick up or handle. Other tattoos might be located in areas that come into frequent contact with your clothing – will the makeup you used to cover the tattoo on your forearm stay on when you put on and take off your jacket? If you’re covering up a tattoo in a high-contact location, be sure to take extra care to seal it (whether you’re taking the DIY route of using hairspray or buying a product designed specifically for the purpose) or consider using theatrical makeup if it’s something you won’t need to cover frequently. So much of what you’re doing when you cover a tattoo with makeup is neutralizing the bolder features of your tattoo. Before you apply the concealer, you need to take a few steps to even out the colors, tone it down, and make it lighter. That means you’ll need fewer layers and have an easier time getting the results you want if your tattoo is already on the lighter side. In fact, if your tattoo doesn’t have any dark colors whatsoever (including the outline), you might be able to do a decent job covering it up just with concealer. If you’ve got a jet black tattoo, though, you might struggle to hide it with everyday products, so it might be worth investing in corrective makeup. For the same reasons, an older tattoo will be easier to cover with makeup than a new one. Tattoos are permanent, but their vibrancy isn’t. Every tattoo fades, so unless you get it retouched along the way, your tattoo will get lighter and lighter with time. Normally, tattoo fading isn’t something to celebrate. However, if you want to cover it up, you’ll need less product and have an easier time, the older your tattoo is. If you can’t seem to get the makeup thing right or are looking for a more permanent solution, there are a few options you can consider. This only works for light-colored tattoos that are fairly small. Spray tans don’t just darken the skin but also cover it up to some extent. If you want to know whether this will work for you, go to your local tanning salon and ask if their treatments will be able to mask your tattoo. Sometimes you’re not trying to conceal your tattoo because you want to make it seem like you don’t have one – sometimes you just wish you didn’t have the design you chose a while ago. If you regret something about your tattoo, wish it had been done better, or think that it’s too vulgar for your workplace or to display around your children, a tattoo coverup might be a better option than using makeup. A tattoo coverup is a tattoo you get over your existing one, either to cover it completely or modify some portion of it. It’s a popular option for getting rid of an ex’s name or to redo a tattoo that was done too crudely. Whatever the reason, it’s a great way to keep the tattooed aesthetic while updating the design so that it suits where you are in your life. If you want to get rid of the tattoo permanently, laser removal is the safest and most effective method. It involves using a specialized laser to blast your tattooed skin with quick bursts of highly concentrated light. That procedure breaks down the tattoo ink particles in your skin, which allows your body to flush them out. The procedure will likely take several sessions and many months to complete. That’s fine if you’re looking for a long-term solution, but it won’t be much help if you need to conceal your tattoo for an event that’s just around the corner. 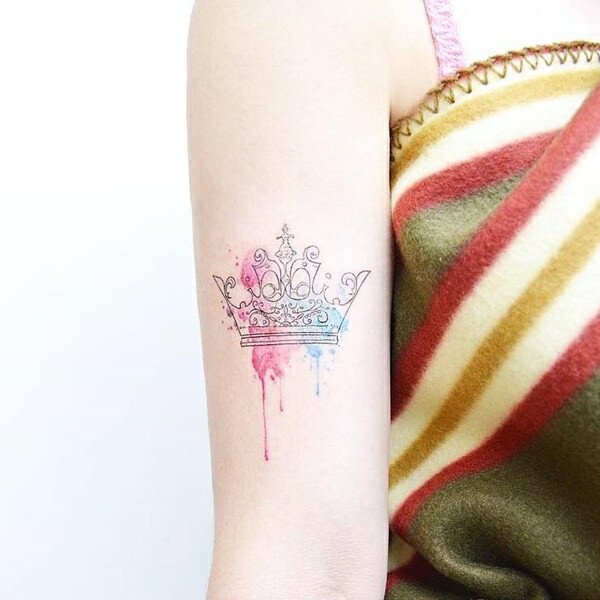 If you decide to get your tattoo lasered while still occasionally covering it with makeup, the laser sessions will gradually fade your tattoo and make it easier to cover. Everyone knows that a tattoo is permanent, but that doesn’t mean it always has to be exposed. In many cases, you can cover it by wearing the right kinds of clothes, but when that doesn’t work, you can resort to concealing it with makeup. Covering a tattoo with makeup might seem like a difficult or impossible task at first, but you can get some good results with little effort. All it takes to hide your tattoo is a few simple steps and some ordinary makeup products.